The main goal during its development process was to create a stand-alone and mobile (portable) MRZ and RFID reading device, thus making the use of additional desktop PC or laptops unnecessary. To achieve the proposed goal, AR Hungary's developers integrated the device into a convenient 22.4x23.2x12.4 cm size box. Its sturdy metal frame surrounds an industrial computer, with a hard disk of 40 Gbyte (upgradeable). It has a TFT LCD 640x480 resolution display and keyboard as well as all the connectors needed in order to use it as a regular PC. The PR303 takes 200 PPI images in two illumination: visible white and IR , and uses a fast image-taking and processing method and reliable OCR (Optical Character Recognition) operation. The optimised power consumption and the professional batteries offer more than 3 hours of continuous operation. The PR303 is delivered with as easy-to-use API supporting C/C++, Visual Basic, Delphi ans Java environments on Windows platforms. Using the functions library, custom-tailored, end-user applications can easily be developed thus meeting special user requirements. Its structure, the optical characteristics, the built-in industrial computer and the comprehensive functions library make the PR303 a considerable and cost-effective solution for any application where mobility, high quality, robust and compact construction are a must. 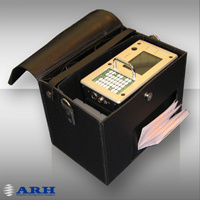 The device is delivered with a black leather case for easy carriage.